Background: We aimed to investigate the treatment efficacy of ampicillin prophylaxis accompanied by Lactobacillus casei rhamnosus over the latency period following preterm premature rupture of membranes (PPROM). Methods: Records of 40 patients who presented with PPROM between 230/7–316/7 weeks were analyzed retrospectively. Patients were divided into two groups: group 1 (n=20), treated with ampicillin; and group 2 (n=20), treated with ampicillin plus L. casei rhamnosus. Clinical and laboratory parameters were compared. Delta (∆) values of each laboratory parameter were calculated by subtracting the value at delivery from the values at admission to the clinic. 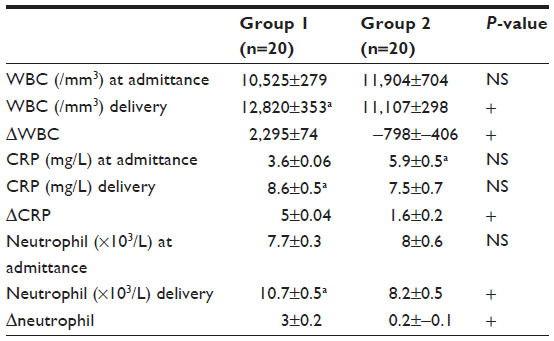 Results: Gestational weeks at delivery (28.1±0.3 weeks versus 31.5±0.4 weeks), latency periods (12.3±1.5 days versus 41.4±4.4 days), 5-minute APGAR scores (6.8±0.1 versus 7.8±0.1), and birth weights (1,320±98 g versus 1,947±128 g) were significantly higher in group 2. White blood cell (WBC) (12,820±353/mm3 versus 11,107±298/mm3), and neutrophil counts (10.7±0.5×103/L versus 8.2±0.5×103/L) were significantly lower in group 2 at delivery. The ∆WBC (2,295±74/mm3 versus -798±-406/mm3), ∆C-reactive protein (5±0.04 mg/L versus 1.6±0.2 mg/L), and ∆neutrophil (3±0.2×103/L versus 0.2±-0.1×103/L) were significantly lower in group 2. Conclusion: It seems that addition of L. casei rhamnosus to ampicillin prolongs the latency period in patients with PPROM remote from term. The purpose of our study was to investigate the efficacy of giving probiotic Lactobacillus casei rhamnosus with ampicillin prophylaxis over the latency period, and maternal and neonatal morbidity, in cases of PPROM under 32 weeks of gestation. This retrospective study was performed by the Firat University Department of Obstetrics and Gynecology, Elazig, Turkey, between July 2011 and June 2013. The study protocol was approved by the Firat University, Faculty of Medicine, Clinical Research Ethics Board. Clinical and laboratory parameters were determined from medical records. Patients in active labor at the time of admission, those with fetomaternal infection, fetal distress, or vaginal bleeding, and those with other obstetric risk factors, such as pregnancy induced hypertension, gestational diabetes, intrauterine growth restriction (IUGR), fetal anomaly, and multiple pregnancies, were excluded from the study. Diagnosis of PPROM was based on history and confirmed by observation of amniotic fluid collection on sterile speculum examination or with at least two positive ferning and nitrazine tests or, if required, with an AmniSure® ROM Test (AmniSure International LLC, Boston, MA, USA). During examination, bimanual pelvic examination was avoided. For confirmation of gestational age and evaluation of amniotic fluid volume, ultrasonography was performed. In the context of follow up for chorioamnionitis, daily clinical examination, daily ultrasonograph evaluation, and nonstress test were performed, and vital sign findings were collected at 6-hour intervals. White blood cell (WBC) counts (/mm3), neutrophil count (×103/L), and C-reactive protein (CRP) levels (mg/L) were checked once every 3 days, and the numbers at the time of admission and delivery were recorded and compared. Delta (Δ) values of each laboratory parameter were calculated by subtracting the value for each patient at delivery from the values at admission to the clinic. Starting from 240/7 weeks, betamethasone 6 mg/day (in two doses per 24 hours) was given to all patients, for faster lung maturation. Vaginal delivery was preferred if an obstetric or maternal indication for Cesarean-section was not present. After delivery, 5-minute APGAR scores, birth weight (g), gestational age at delivery (weeks), and latency period (days) were recorded for each patient. All newborns were followed for adverse perinatal events. In the statistical analysis of the data, the IBM SPSS for Windows Version 21.0 program (IBM Corp, Armonk, NY, USA) was used. The Mann–Whitney U test was used to compare variables between groups. The Wilcoxon signed-rank test and chi square (χ2 test) were used for the comparison of variables in each group. P<0.05 was considered as significant. Records of a total 40 patients diagnosed with PPROM and without infection findings (clinically and by laboratory) at admission were assessed retrospectively. They were between 230/7–316/7 gestational weeks. Mean maternal age (years), gravidity (number), parity (number), and gestational age at admission (week) are shown in Table 1. No statistically significant difference was observed between group 1 and group 2 in terms of these variables (P>0.05, Mann–Whitney U test). Notes: Values are given as mean ± SEM. NS = P>0.05 (Mann–Whitney U test). Abbreviations: SEM, standard error of the mean; NS, not significant. There were statistically significant differences between group 1 and group 2 in terms of gestational age at delivery, latency period, 5-minute APGAR score, and birth weight. These variables were higher in group 2. The shortest latency period was 14 days and the longest was 70 days (mean 41.4±4.4 days) in group 2 compared with 5 days and 28 days (mean 12.3±1.5 days), respectively, in group 1. Clinical parameters are shown in Table 2. Notes: Values are given as mean ± SEM. A = statistically significant (P<0.05, Mann–Whitney U test). In our study CRP, leukocyte, and neutrophil counts were similar between groups 1 and 2 at the time of admission and delivery. But statistically significant differences were observed between groups for the WBC count at delivery, ΔWBC levels, ΔCRP levels, neutrophil count at delivery, and Δneutrophil levels. The WBC counts, and CRP and neutrophil levels, at admission and delivery, and their Δ values are shown in Table 3. Notes: Values are given as mean ± SEM. aP<0.05 (Wilcoxon rank test); NS = P>0.05 (Mann–Whitney U test); + = P<0.05 (Mann–Whitney U test). Abbreviations: Δ, delta; CRP, C-reactive protein; NS, not significant; SEM, standard error of the mean; WBC, white blood cells. ΔWBC (2,295±74/mm3 versus −798±−406/mm3), ΔCRP (5±0.04 mg/L versus 1.6±0.2 mg/L), and Δneutrophil (3±0.2×103/L versus 0.2±−0.1×103/L) were significantly lower in group 2. Moreover, WBC (12,820±353/mm3 versus 11,107±298/mm3) and neutrophil counts (10.7±0.5×103/L versus 8.2±0.5×103/L) were significantly lower in group 2 at delivery. No findings of infection (maternal fever over 38°C, maternal tachycardia [≥120 beats/min], leukocytosis [≥20,000/mm3], uterine tenderness and irritability, foul-smelling vaginal leucorrhea, or fetal tachycardia [≥160 beats/min]) were detected in group 2 up until the time of delivery. However three patients in group 1 showed signs and symptoms of clinical chorioamnionitis. While uterine tenderness and vaginal leucorrhea were the prominent symptoms in one patient, maternal fever and fetal tachycardia attracted attention in the other two. These three patients were delivered as soon as possible. None of the newborns showed major fetal anomaly. In group 1, six newborns were intubated. One patient was extubated at 10 days and the other at 12 days. Two patients died due to sepsis, and two patients died due to respiratory distress syndrome. In group 2, two newborns needed intubation and were extubated at 6 and 9 days. No laboratory and clinical infection findings were detected. No neurologic sequelae were identified among the surviving babies in both groups at 6 months. PPROM remote from term occurs in less than 1% of pregnancies, but it associated with significant maternal and fetal risks.8 It is a major cause of perinatal morbidity and mortality. In our study, we retrospectively compared the treatment efficacy of ampicillin and ampicillin plus L. casei rhamnosus over the latency period, and fetomaternal outcomes, in patients with PPROM remote from term. More than one-half of women with midtrimester PPROM will deliver within 1 week and about three-quarters will deliver within 2 weeks.9 However, subsets of these women remain pregnant for an extended period of time, allowing the fetus to mature in utero. To prolong the latency period in PPROM, tocolytic treatment is used. But the value of tocolytic treatment after PPROM remains controversial. The primary argument against such treatment has been that PPROM is commonly associated with subclinical intrauterine infection.2 Nevertheless, tocolytic use is generally, but not uniformly, limited to 48 hours or less to attain steroid benefit. Another therapy prolonging the latency period is the use of antibiotics. The latency period is significantly longer in PPROM cases managed actively with prophylactic antibiotics.7 For that purpose, one of the most preferred regimes is that recommended by the National Institute of Child Health and Human Development (NICHD). In this regime, intravenous (IV) ampicillin is started in the first 48 hours, and maintenance treatment with amoxicillin or enteric coated erythromycin is given in the following 5 days.5,10 In a previous study, in which imipenem/cilastatin, was given as a wide-spectrum antibiotic to PPROM patients, the latency period and perinatal morbidity was affected positively.11 The latency period was prolonged for 5 days when compared to the control group in that study. Although one study showed that prolongation of the latency period for more than 14 days had no positive effect on neonatal outcome, many medications were tried to prolong the latency period.10–13 However, none were as effective as our combination of ampicillin plus L. casei rhamnosus. In our study, the latency period was 12.3±1.5 days in group 1 and 41.4±4.4 days in group 2. Antibiotic therapy was given to both groups. There was no maternal infectious morbidity, such as chorioamnionitis, endometritis, or wound infection, among patients taking L. Casei Rhamnosus in addition to prophylactic ampicillin. We have found that the addition of L. casei rhamnosus to ampicillin lowered the laboratory parameters of infection and the rate of adverse neonatal and maternal events. The limitations of our study were the low number of the patients and retrospective nature of the study. So, multicenter prospective, randomized controlled studies are needed before recommending this as a mode of treatment. Mercer BM. Preterm premature rupture of the membranes. Obstet Gynecol. 2003;101(1):178–193. Melamed N, Ben-Haroush A, Pardo J, et al. Expectant management of preterm premature rupture of membranes: is it all about gestational age? Am J Obstet Gynecol. 2011;204(1):48. e1–48. e8. Gopalani S, Krohn M, Meyn L, Hitti J, Crombleholme WR. Contemporary management of preterm premature rupture of membranes: determinants of latency and neonatal outcome. Am J Perinatol. 2004;21(4):183–190. Mercer BM. Preterm premature rupture of the membranes: current approaches to evaluation and management. Obstet Gynecol Clin North Am. 2005;32(3):411–428. ACOG Committee on Practice Bulletins-Obstetrics. ACOG Practice Bulletin No 80: premature rupture of membranes. Clinical management guidelines for obstetrician-gynecologists. Obstet Gynecol. 2007;109(4):1007–1019. Boris S, Suárez JE, Vázquez F, Barbés C. Adherence of human vaginal lactobacilli to vaginal epithelial cells and interaction with uropathogens. Infect Immun. 1998;66(5):1985–1989. Queenan JT, Hobbins JC, Spong CY, editors. Preterm premature rupture of membranes. In: Mercer B. Protocols for High Risk Pregnancies. 5th ed. West Sussex: Wiley-Blackwell; 2010:448–460. Yeast JD. Preterm premature rupture of the membranes before viability. Clin Perinatol. 2001;28(4):849–860. Louis JM, Ehrenberg HM, Collin MF, Mercer BM. Perinatal intervention and neonatal outcomes near the limit of viability. Am J Obstet Gynecol. 2004;191(4):1398–1402. Mercer BM, Miodovnik M, Thurnau GR, et al. Antibiotic therapy for reduction of infant morbidity after preterm premature rupture of the membranes. A randomized controlled trial. National Institute of Child Health and Human Development Maternal-Fetal Medicine Units Network. JAMA. 1997;278(12):989–995. Ryo E, Ikeya M, Sugimoto M. Clinical study of the effectiveness of imipenem/cilastatin sodium as the antibiotics of first choice in the expectant management of patients with preterm premature rupture of membranes. J Infect Chemother. 2005;11(1):32–36. Combs CA, Garite TJ, Maurel K, et al; Obstetrix Collaborative Research Network. 17-Hydroxyprogesterone caproate to prolong pregnancy after preterm rupture of the membranes: early termination of a double-blind, randomized clinical trial. BMC Res Notes. 2011;4:568. Pasquier JC, Picaud JC, Rabilloud M, et al. Neonatal outcomes after elective delivery management of preterm premature rupture of the membranes before 34 weeks’ gestation (DOMINOS study). Eur J Obstet Gynecol Reprod Biol. 2009;143(1):18–23. Been JV, Rours IG, Kornelisse RF, et al. Histologic chorioamnionitis, fetal involvement, and antenatal steroids: effects on neonatal outcome in preterm infants. Am J Obstet Gynecol. 2009;201(6):587.e1–587.e8. Gibbs RS, Romero R, Hillier SL, Eschenbach DA, Sweet RL. A review of premature birth and subclinical infection. Am J Obstet Gynecol. 1992;166(5):1515–1528. Atassi F, Brassart D, Grob P, Graf F, Servin AL. Lactobacillus strains isolated from the vaginal microbiota of healthy women inhibit Prevotella bivia and Gardnerella vaginalis in coculture and cell culture. FEMS Immunol Med Microbiol. 2006;48(3):424–432. Saunders S, Bocking A, Challis J, Reid G. Effect of Lactobacillus challenge on Gardnerella vaginalis biofilms. Colloids Surf B Biointerfaces. 2007;55(2):138–142. Aroutcheva AA, Simoes JA, Faro S. Antimicrobial protein produced by vaginal Lactobacillus acidophilus that inhibits Gardnerella vaginalis. Infect Dis Obstet Gynecol. 2001;9(1):33–39. Dover SE, Aroutcheva AA, Faro S, Chikindas ML. Safety study of an antimicrobial peptide lactocin 160, produced by the vaginal Lactobacillus rhamnosus. Infect Dis Obstet Gynecol. 2007;2007:78248. Li J, Aroutcheva AA, Faro S, Chikindas ML. Mode of action of lactocin 160, a bacteriocin from vaginal Lactobacillus rhamnosus. Infect Dis Obstet Gynecol. 2005;13(3):135–140. Anukam KC, Reid G. Probiotics: 100 years (1907–2007) after Elie Metchnikoff’s observation. In: A Méndez-Vilas editor. Communicating Current Research and Educational Topics and Trends in Applied Microbiology. Badajoz: Formatex; 2007:466–474. FAO/WHO Working Group on Drafting Guidelines for the Evaluation of Probiotics in Food. Guidelines for the Evaluation of Probiotics in Food. London, ON: Food and Agriculture Organization of the United Nations/World Health Organization; 2002. Available from: ftp://ftp.fao.org/es/esn/food/wgreport2.pdf. Accessed July 15, 2014.